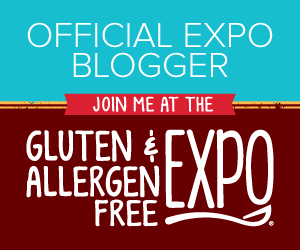 The Gluten Free Maven: Happy Day! My neighbor was having a margarine crisis last night into today. It's her birthday today and her husband and daughters baked her a cake. But she's out of margarine for the frosting (she doesn't like Crisco in her frosting). As her husband was leaving the house last night to buy margarine her daughter sprained her ankle on the stairs and they were in the emergency room until past midnight. Refuah Shleimah! This morning she called me for margarine, but I was out. When I got in touch with her she was happy to report that she went to the store and surprise, surprise, the large canisters of Duncan Hines Whipped Frosting in Chocolate and Vanilla is now pareve. That's right...pareve! Happy day!!! This great convenience item is back for those that are dairy allergic and who want to use it following a meat meal on Shabbos or any other time. I called to find out if it was gluten free. The perky customer service lady (I love speaking to the Mid-west...they're so polite) listed all their frosting flavors that are gluten free, and they do have alot. However, most of the varieties are OU-D. Then she added she would send me the entire gluten free list by mail, along with some money saving coupons, yippee! Duncan Hines gets a "thumbs-up" from me as a gluten friendly company. There is something somewhat macabre about babies clinging to lifesavers in the waves. But it's cute somehow. I make it a bit different than Martha. I put a few drops of blue food coloring in the frosting and stir it with a spatula, but not until it is combined completely. Leave it a bit swirly and ununiformly colored blue. That way you get the effect of white caps on blue water. I pipe the frosting on using a large star tip, and I find it gives a great wave look. 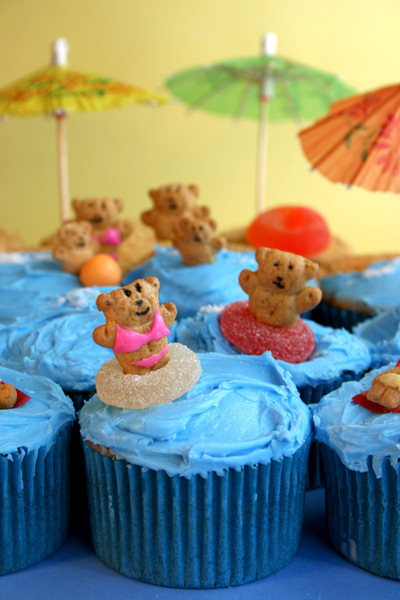 I use jelly rings instead of lifesaver candies (see bear cupcakes below), then I stick the little plastic babies (available in the cake decorating section of craft stores) right in the center, so they look like they are floating in an inner tube, as opposed to desperately grasping for a lifesaver ring at sea. I found the cheapest place to order the plastic babies at Oriental Trading. Careful though, as the plastic babies are choking hazards. Sadly, the last time I made these I didn't take a picture, so you will have to make do with the two I provided today to give you an idea. They really are a big hit for new baby boy celebrations. Someone brought me a box of Cherrybrook Kitchens Gluten Free Cake mix today. Now all I need is for a someone I know to have a baby boy and I'm good to go! This image is from www.bakerella.blogspot.com. Have it your way....or the towering tostada!